The Back Mirror Plate is a great way to accessorize your H2. Note: Diamond Plate orders may take 4-8 weeks to deliver. Hummer, H2 and H3 are registered trademarks of General Motors Corporation and are used for identification purposes only. 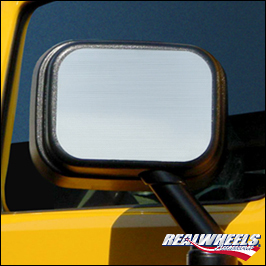 RealWheels Corporation and its products are not affiliated with General Motors Corporation products.